How is everyone liking the new Presto site? It is nice that you can have a user ID so you don’t have to enter your card number to log in. Though, I should say that you MUST now have a user ID, and the process to set it up if you were have a card from before is not exactly straight-forward. The process involves you typing in your card number more than once, along with the three digit code (like the CVV on a credit card) and your old online PIN. Each time, it will not like something about one of those, but when you type it again, it will be happy about it, but have a problem with one of the other two and make you do it all over again. Even though you enter everything the same each time (I assured this for myself by typing the numbers in a text editor, then using copy/paste to fill in the Presto form! ), it will eventually take everything. Once you get over that experience, there is the little matter of your balance summary lagging behind the actual transaction history. I am not speaking of the time lag that is part of the Presto system and always has been. Users of Presto know that there is a time lag between performing an ePurse load and it actually showing up in your online balance. This is needed for a system that requires instant approval when one is boarding a vehicle in order to not hold up the line. To repeat how this works: Your card stores your balance and fares must be paid from that. When one performs a load, the details of your load must be sent to all Presto terminals since it is not know which one will be the next one you tap on with. When a tap is performed, if the terminal knows about a load pending for your card, it will pass that information to your card before taking the fare (if applicable). If you use a terminal that can check your balance, the load can be passed on as well when the balance checking is done as well. Once a terminal has told your card about the load, it must report back to the back-end system that it has completed. Once that has occurred, you can see the load in the transaction history online. Fixed terminals, such as those at GO stations, TTC stations, and VIVAstations, have a connection that allows them to communicate with the back-end system almost anytime. Terminals on buses only get the chance to speak with the back-end system when they are in the garage overnight, so they can take longer to know about a load, and take additional time to report back if it updated your card. Notice that the summary amount at the top still shows $29.05, but when you go down the list, you see that the summary does NOT take into account the effects of a $3.00 transaction that makes the balance $26.05! This is not a case of the back-end not yet knowing about a transaction because the terminal on the vehicle has not reported it yet. Everything has been reported and shows on the history, but the summary is not being determined properly. 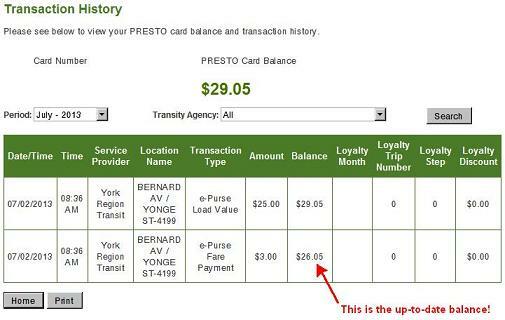 I have reported this to Presto, but so far I have not received any response about the issue. This entry was posted on Wednesday, July 3rd, 2013 at 10:08 am	under Presto. Don’t worry. It’ll be fixed when the DRL opens for business. Cal’s comment: Perhaps, but surely you mean when the second phase from Danforth to Eglinton opens for business. Or maybe that should be the western phase!